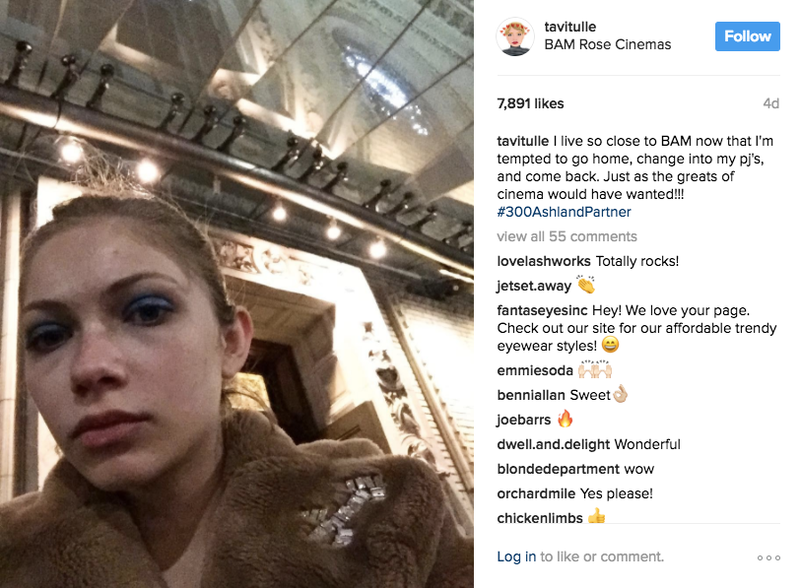 Tavi Gevinson recently moved into a new apartment in what real-estate developers would like you to call the Brooklyn Culture District and which is actually called Fort Greene, a historically black, middle-class neighborhood. The Rookie founder/editor-in-chief and actor has been posting to Instagram about her new digs, because moving is always very exciting, and also because her building’s developer is paying her to do so. The spokesperson confirmed that Gevinson is “paying rent and being compensated,” but would not comment on the financial arrangement any further. He would not say, for example, exactly how much rent Gevinson is actually paying, or how much Two Trees was paying her. The gossip blog Oh No They Didn’t picked up on Gevinson’s posts last week, noting her use of the building’s geotag and the hashtag #300AshlandPartner, a clear reference to the building’s address. In her a role as a fashion writer, Gevinson has historically been responsible about disclosing gifted products, but there is nothing beyond that cryptic hashtag in her posts to indicate that Two Trees is paying her for them, which has gotten other celebrities in hot water in the past. A reasonable person would likely look at these posts and think Gevinson is an authentically happy tenant of 300 Ashland. The Federal Trade Commission, which protects consumers from “unfair or deceptive acts or practices,” announced just last year that it would be cracking down on sponsored content—that is any time a material connection exists between a company and the person endorsing their product. According to the FTC’s endorsement guidelines, any time that’s the case, it should be made very clear—even #sp appended to a post may not be enough to pass the FTC’s muster. In February of 2017, the average rent for a one-bedroom in Fort Greene was $2,872/month. A studio apartment at 300 Ashland is renting for $2,555/month, and a one-bedroom is going for $3,258/month. Whatever you’re paying to live at 300 Ashland, one of the “amenities” you’re paying for—along with a bike room and cold storage—is Tavi Gevinson as a neighbor. Gevinson did not return a request for comment.